We are proud to present our latest addition to our Bottle Sealing Wax portfolio – DW740. Looking for a high temperature wax to make your brand stand out? Drinks companies have been using bottle sealing wax for hundreds of years to help keep bottles airtight. With the recent explosion in demand for premium drinks, many brands are looking to use visually attractive bottle sealing wax. This helps make their products stand out from the other bottles on the shelf. However, current bottle sealing waxes are soft and have a low melting point. Consequently, they soften during elevated temperatures and high pressures caused by liquid expansion. Hence, corks regularly pop during transit – especially when exporting to hot countries, or via airfreight. Following several complaints regarding the failure of existing bottle sealing waxes, we have developed DW740. This is a premium, high temperature bottle sealing wax. Carefully formulated using our vast library of high quality raw materials, DW740 is the answer to problems with traditional waxes. Temperature resistant: DW740 can be held at 45°C over many days and despite the increased pressure due to liquid expansion, the wax holds the cork tight. No cracking: DW740 wax is flexible and remains free from cracks, even at freezing temperatures. 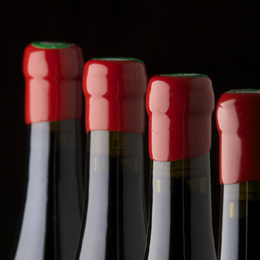 Easy-Peel: Our chemists designed DW740 for use with a tear strip, and is therefore easily peeled to open the bottle. Matt or Gloss finish: Contact our team to discover how to achieve either finish. Various formats: DW740 is available in both block or pastille formats. Bottle sealing wax pastilles are cost-effective and convenient format. We can also supply in custom shapes and sizes if necessary. Complete technical service: With 7 full-time chemists on board, we can offer unbeatable technical advice. Aerospace-level Quality control. ISO 9001:2015. Many high level approvals from global brands. We become your very own wax department. As with all of our products, we can tweak DW740 to suit individual brands. Custom colours are certainly available, just email us with a pantone reference or an image of any colour, and we’ll start working on your custom colour. We also offer coloured waxes for other applications – click here to see a small selection of our other coloured waxes. Contact us now for more details, data sheets and a quote!